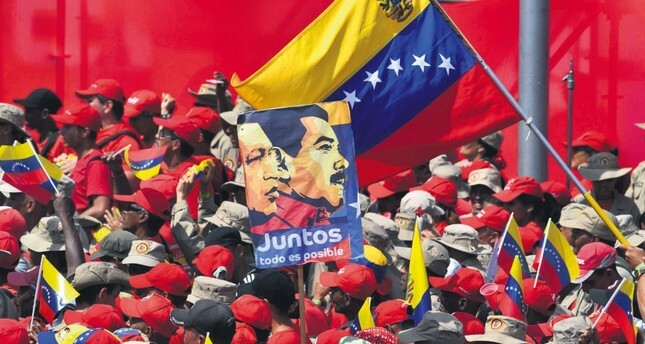 Supporters of Venezuelan President Nicolas Maduro gather to mark the 20th anniversary of the rise of power of the late Hugo Chavez, Caracas, Feb. 2, 2019. Nothing seems to be working in the EU like it used to. The latest crisis over the legitimacy of President Nicolas Maduro in Venezuela is a blatant example. Following the controversial move of U.S. President Donald Trump to recognize Juan Guaido as the legitimate president of Venezuela, European Union countries have gathered to establish a "common position." This is how the EU usually works regarding external affairs. Formerly called the Common Foreign and Security Policy, the external relations guideline remains chiefly an intergovernmental cooperation within the EU. Obviously, to please all member states – 28, soon to become 27 – common positions are most of the time superficial declarations of consensus, accepted by all member state governments. The situation in Venezuela created deep divisions between different governments of the EU. Some countries, such as Greece, resolutely opposed the condemnation of the Maduro presidency and its removal. A large majority of the governments accepted a declaration that condemned Maduro's new presidential system, without recognizing Guaido. At the end of the day, six leading countries of the EU, namely Germany, France, the United Kingdom, Spain, Portugal and the Netherlands, have opted for a joint ultimatum for Maduro: either organize presidential elections in eight days or face Guaido's recognition as the legitimate president. Austria recently declared that it would follow and support the decision of these six EU countries; whereas, the rest of the bloc remains at best reluctant to opt for such a blunt position. Giuseppe Conte's Italy declared that it would not be opportune to recognize Guaido's presidency since it had not been validated by a democratic electoral process. EU six have been accused of lining up with Trump's position too quickly. That is partly true, as so far Canada and the Lima Group countries, namely Argentina, Brazil, Chile, Colombia, Costa Rica, Guatemala, Guyana, Honduras, Panama, Paraguay, Peru and Saint Lucia, have already joined the condemnation of Maduro's regime. It is also true that the EU has refused to accept the legitimacy of Maduro's last presidential election, which can hardly be seen as democratic and participative. Back then, the opposition was prevented from offering a common candidate, and the election date was changed to a much earlier day, which prevented the primary caucuses for the opposition. In retaliation, the opposition refused to participate in the elections, which saw two candidates in contention: Maduro and a former Chavist-turned opponent, Henry Falcon. The participation rate was only 46 percent, and Maduro received 68 percent of the votes. It is a bit meagre to be accepted as a democratic landslide victory. On the other hand, Guaido is a newcomer, as the president of the National Assembly, relatively young, has had the courage to organize a public meeting in central Caracas, to defy the regime and to herald himself as the legitimate president by interim. In a city where almost everyone possesses a firearm, Guaido's deed has been impressive for the public opinion. However, there is more. There are 2,000 people leaving Venezuela daily in search of jobs and livelihoods. The economy has been totally devastated due to the absence of prevision of the government, and a formerly wealthy country is now at bay. Venezuelan problems will not be solved by fabricating dubious presidential elections. Another fact is that nobody believes that Donald Trump's America could bring "democracy" to a foreign country. The world has seen that before, and the terrible consequences of such "democracy exportation" speak for themselves. The Middle East has been utterly devastated; central and Latin American countries' history is full of illegitimate coups fomented by the CIA. In the words of former U.S. Secretary of State Condoleezza Rice, the U.S. has always preferred "stability" to "democracy" in a bipolar world. In the end, both stability and democracy were lost. Today, nobody will buy Trump's "democratic motivations" for Venezuela. Since Chavez, Venezuela has had a long tradition of demonizing the neo-con administrations in the U.S. As a reaction, Venezuela has become almost a "new Cuba" for the American right-wing. Maduro is still supported by China, Russia, Cuba, Mexico and Turkey. Greece and Turkey share their refusal to see Maduro ousted by foreign pressure. Their support has important political weight but nothing more. On the other hand, China, Mexico, Cuba and to some degree, Russia do play a very important economic roles for Venezuela. Without their support, Maduro would be lost. Therefore, the situation is very intricate, with every analyst concurring that the Venezuelan Army will have the last word. It was a very bad idea, on the part of the six EU countries, to align themselves with Trump by overlooking the EU solidarity and thinking that an ultimatum – bluntly rejected by Maduro – could help solve the existing problems.